World Music at LMU presents its 20th Annual Spring performance this coming Sunday, 23 April 2017. More information here. The World Music at LMU program began in 1998 when new instruments arrived at LMU on commission from West Africa. With these, the program was able to accompany newly-learned dances and songs from the Volta region of southeastern Ghana. Three years later, the Department of Music welcomed new instruments from Indonesia—a literal ton of them—made of mostly wood and bronze. Music for Balinese gamelan then joined Ghanaian drumming and dance as a staple of the World Music performance repertoire ever since. Over the years, World Music Ensembles at LMU have been invited to perform for President Snyder’s Inauguration (2015), President’s Institutes (2006 and 2013), and as a featured ensemble in the World Festival of Sacred Music, Los Angeles (2005 and 2008). An especially memorable chapter in that history is the Festival of Indonesia (2002), during which LMU hosted guest artists from Ubud, Bali in a day-long schedule of events. These included breath-taking performances, a processional gamelan across the newly opened bridge to U-Hall, workshops with students in both music and dance, and a welcome to our visiting artists from the Consul General of Indonesia. 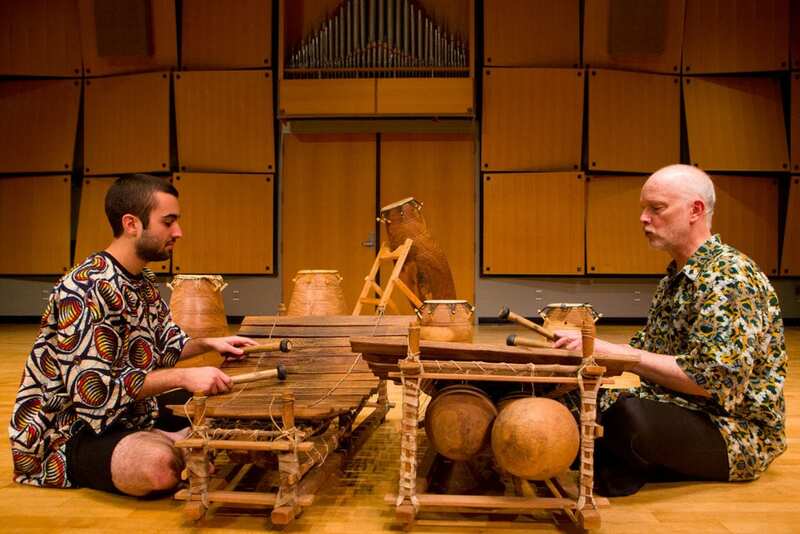 For this year’s Spring Concert, LMU Gamelan, Kembang Atangi will be joined by two distinguished members of the Department of Music’s artist faculty in the performance of a work by Lou Harrison. Harrison was both a student of Korean and Indonesian music, and a celebrated composer who worked at one point in collaboration with John Cage. One of Harrison’s many iconic remarks is “Don’t knock the hybrids—that’s all there are.” His Double Concerto for violin, cello and gamelan, in which music faculty Kennichiro Aiso and Yoshika Masuda will be featured, is one lovely piece of evidence that he lived by those words.